As it turned out, three events this Spring in the same town at the same time invited my ceramic works to participate. 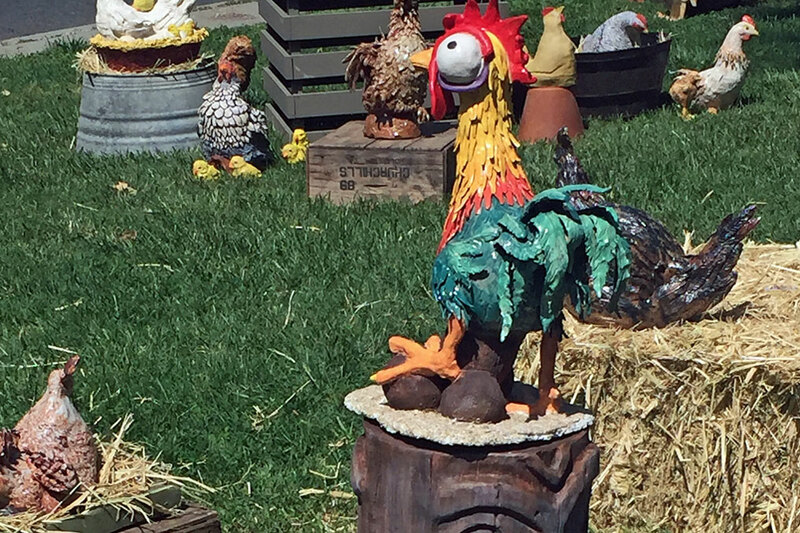 One entailed making a chicken, any kind of clay chicken, to be shown with dozens of other chickens in a group setting on a lawn. A second asked me to add larger works to those they already displayed in their Gallery Shop. 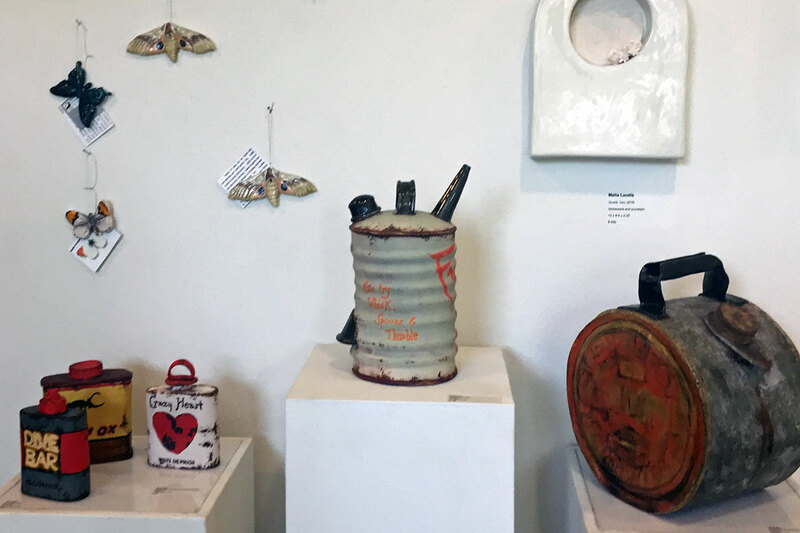 A third was an annual statewide ceramics exhibit, juried, curated and fairly prestigious. I was happily All In with all three and here’s a briefly annotated photo essay so you can be All In along with me. Starting with the third event, the California Clay Competition – held annually at The Artery in Davis, CA – entices me yearly, yet I have only entered one other time (2012) and was accepted then as well. Like most folks, I dislike being rejected and it takes a special effort to cowgirl-up enough to feel the worth of my entries in that statewide arena. This time I took the leap because the juror was Tiffany Schmierer, a beloved former instructor, and I simply wanted to formally place my recent work before her eyes, even anonymously….even if she did not select it. These two pieces, Nakie Time and Homefire 1957, are from my personal collection and it means the world to me to display them in this venue in a heady group of mega-talented artists, with her blessing to boot. I went to the Opening Reception, but “forgot” to wear my nametag. Few know me by sight there, so I had the tremendous joy of watching a man encounter Nakie Time, do a double take, smile broadly, get out his phone and ever so slightly tilt the can to the right angle and take a couple of shots, chuckling the while. I got to watch him fall in love! What a testimony. Meanwhile, a few blocks away at The Pence Art Gallery, I have many of my ceramic cans: beer, spice and assorted, available in their Gallery Shop. The Exhibit Coordinator asked if I had anything larger to augment the Gallery during annual Ceramics Conference and beyond. Yep, I did. I selected a few more pieces from my personal collection that I am now willing to part with. It was a pleasant surprise to see them at the head of the stairs on pedestals looking right at home. I’d say it was an honor to bring them there. And lastly, there was that lawn-ful of chickens who flew into town for a long weekend. The Cabrillo College Intermediate Ceramics class, plus friends, made dozens of them. There were eggs and chicks and even a fox under the henhouse. They were elegant and thoughtful, ranging from astonishingly realistic to goofy and endearing. It was great fun to wander through the display a few times and discover new angles and personalities. I had dawdled and dithered in making mine until I was nearly out of time. With three weeks left, desperation focused my mind and hands and the Muses/Kiln Gods supported me. 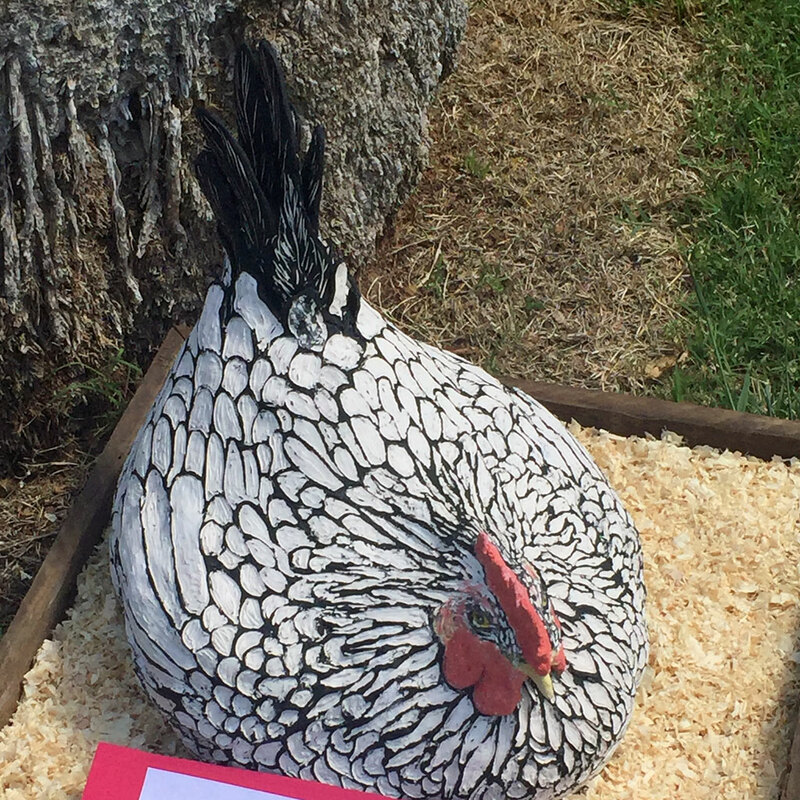 I called her Big Broody – she’s up top there – but the Cabrillo crowd quickly dubbed her Mother Clucker cuz she was of heroic proportions and obviously about to hatch something wonderfully badass. 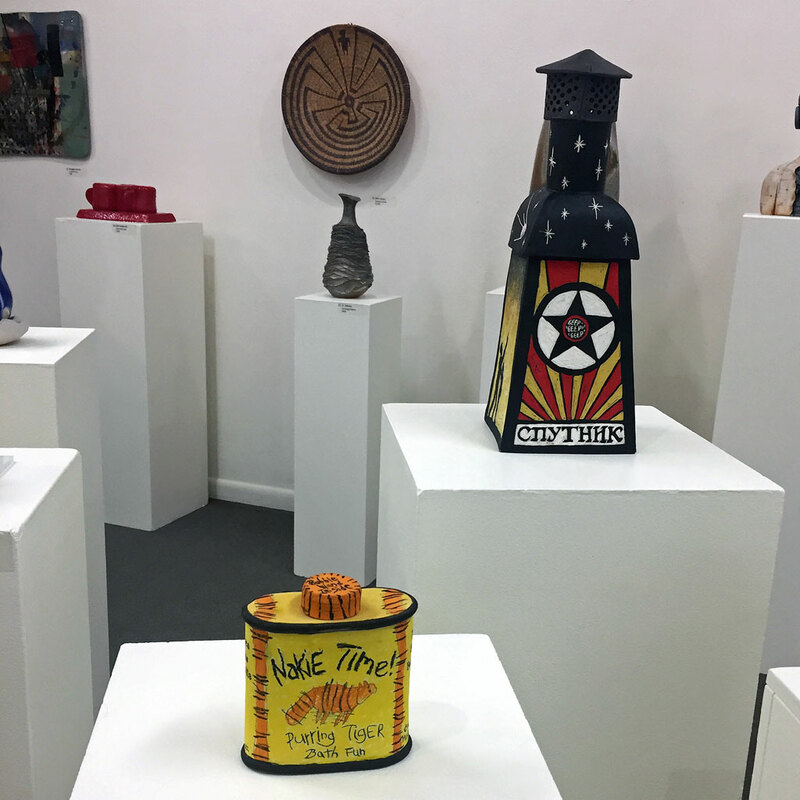 –Liz Crain, who remembers attending the Davis Clay Conference (CCACA) weekend back in the day as an astonished ceramics beginner, never daring to imagine being a participant in the all the exhibits and galleries she was in awe of. Still feeling a tad like Lizzy From the Block, which is probably a good thing, she nevertheless was right at home this year, a refreshing evolution. I really enjoyed the CCACA show this year. I like the group theme that Cabrillo College has presented over the past several years. Outdoors on the lawn was perfect for the “Chickens”. I took photos of them, and will look at them soon. I am glad I ran into you and Mark there. The ceramics, glass, and jewelry show the past three days at MPC was fun, too. Hey Paul! One reason I like going to Davis to walk around is that there are so many people I know to run into because we all love the same thing. We weren’t there that long, but enjoyed all of it, Cabrillo’s unique showing especially. Didn’t make to MPC this weekend, but keep letting me know about it if you can. Thanks. What wonderful news about well deserved recognition. Congratulations. Hey Chris, I bought a bracelet in Davis made by a company called Lokai. It has – among the rest of the beads – two special ones. The white one has water from Mt. Everest and the black one has mud from the Dead Sea. Their slogan is “Sometimes you’re on top of the world. Stay humble.” And I’m here to say that’s exactly what happened for me that weekend, which was much more fun too! Thanks Kathleen! We definitely need to notice when things line up, whether in town or on the airwaves!